Portcullis - the portcullis was basically a gate made of wood or metal, sometimes of both. It was mounted on vertical grooves within the castle walls. A winch would be attached to the portcullis by chains or ropes which would allow the portcullis to be raised or lowered very quickly. Sometimes the castle would have two portcullis, the outer one being lowered last. This would create the opportunity for the castle defenders to trap some of the attackers between the two portcullis. 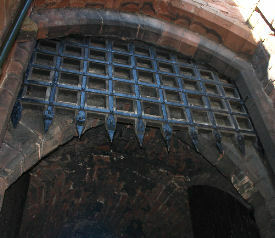 Photograph: Portcullis at the entrance to Carlisle Castle in Cumbria, England. In front of the entrance is a deep ditch which surrounds the castle. As you walk through the entrance of the castle the portcullis towers over your head and is an awesome sight.